There are so many teeth whitening products on the market today, it can be difficult to find the best fit for your needs. Some people use whitening toothpastes because they are affordable and easily fit into a normal brushing routine. However, whitening toothpastes don’t always deliver the desired results. Read on as San Francisco cosmetic dentist Samir Ayoub discusses in detail how well whitening toothpastes work. The results of whitening toothpastes are usually minor at best. Special abrasives in whitening toothpastes may lift surface stains, such as those caused by drinking coffee or red wine, by gently polishing the teeth. However, the ingredients are not powerful enough to tackle deeper stains or change the natural color of the tooth. Even with weeks of consistent use, whitening toothpastes usually cannot produce visibly whiter teeth. 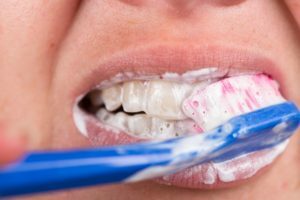 Another consideration to keep in mind is that whitening toothpastes won’t work on any dental restorations, including fillings, crowns or bonding. Using a whitening toothpaste when you have dental restorations may lighten your natural teeth slightly but produce uneven-looking results. There are other ways to enjoy a whiter and more gorgeous smile. If you are looking for the fastest, safest and most effective way to whiten teeth, consider professional chairside teeth whitening. During a short in-office procedure, Dr. Ayoub and our team apply powerful bleaching agents like hydrogen peroxide or carbamide peroxide to the teeth to break up stubborn stains and discoloration, lightening yellow or dull teeth. The chairside whitening process is fast and the results appear quickly. We do our best to consider existing restorations so that you do not end up with uneven looking results. We also take measures to protect your gums and soft tissues of your mouth from the professional-strength bleaching agents so that they aren’t irritated by the ingredients. We can find other workarounds to prevent problems with tooth sensitivity. After an in-office teeth whitening treatment, Dr. Ayoub can provide customized whitening trays to use for touch-ups at home. The trays will be well fitting to prevent the gel from leaking onto your gums and irritating them, and the formulation of the bleaching gel will be stronger than what you would find in a whitening toothpaste. For more information about professional teeth whitening, please contact our practice today to schedule a consultation.